Leicester Tigers are opening a ‘pop-up shop’ in the city’s Highcross Shopping Centre later this month. The store will provide another option for supporters to purchase replica kit, leisurewear and souvenirs as well as match tickets for games at Welford Road. Located opposite the Holland & Barrett store in the upper mall of Highcross, the pop-up shop will be open until January. Chris Rose, head of brand at Tigers, said: “Our new shop is a great opportunity for us to reach even more of our fans with our quality clothing and merchandise ranges. 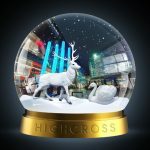 “The Highcross Shopping Centre attracts shoppers from all around the region and beyond so it made sense for us to ensure Tigers fans can now have even better access to their club. “While the store will only be ‘pop-up’ in size, we’re hoping the easy location and fact that fans will be able to purchase match tickets all in one place will prove a great driver for supporters. Tigers replica home and alternate kits are now available in store alongside the new training range. The Tigers store at Welford Road will continue to operate as normal and is open 9.00am-5.00pm Monday-Saturday and 10am-4.00pm Sundays. SIXTY9 Street Style: WIN a £100 Gift Card!